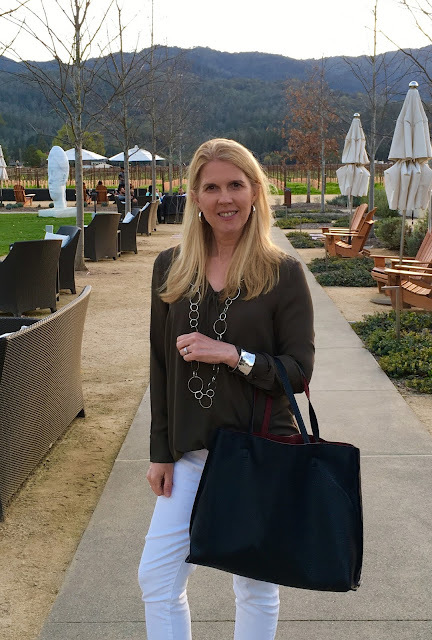 Spring will be upon us by the end of the month and we know you have places to go, so Adrienne of The Rich Life in Wine Country and I thought it was a good time to devote a “How I Wear My” to the hardest working bag in your closet that can carry the most stuff—the tote! This was a fun post to put together for the range of totes in everyone’s photos. It also reminded me how a tote can inject a bit of humor and color into your look. Enjoy! This is such a lovely and romantic look on Adrienne and I like that her tote does double duty as an everyday bag and a travel bag. 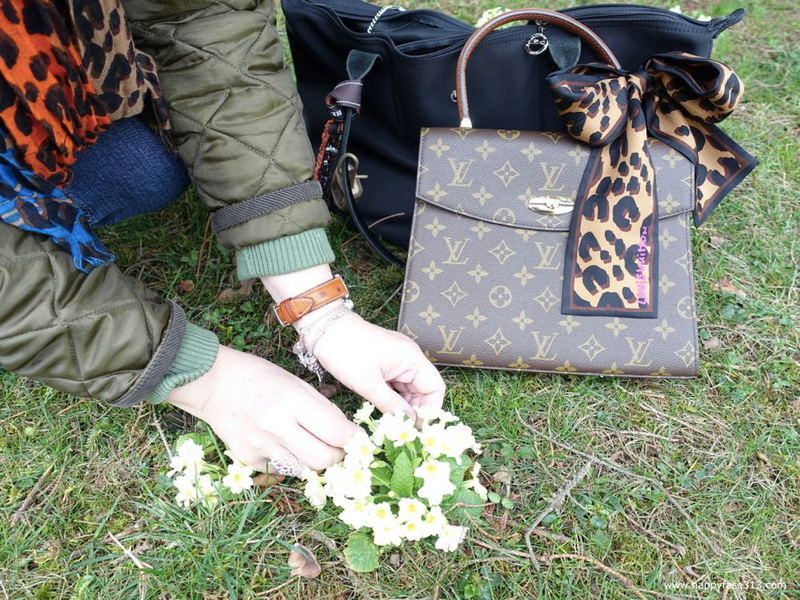 I do believe that is a Louis Vuitton tote in Damier Ebène checkerboard, which is such a stylish bag. It looks so great on Yvonne and I know for a fact that tote is well-made and can carry a ton of stuff! I love these colors on Dawn Lucy and what an unusual tote, I can see why people would want to chat with her about it! I bet she gets compliments on it all the time. I love the story behind this tote—literally cut from the cloth of something her son wore and that she made it herself. How’s that for American-made style, drive, and ingenuity? 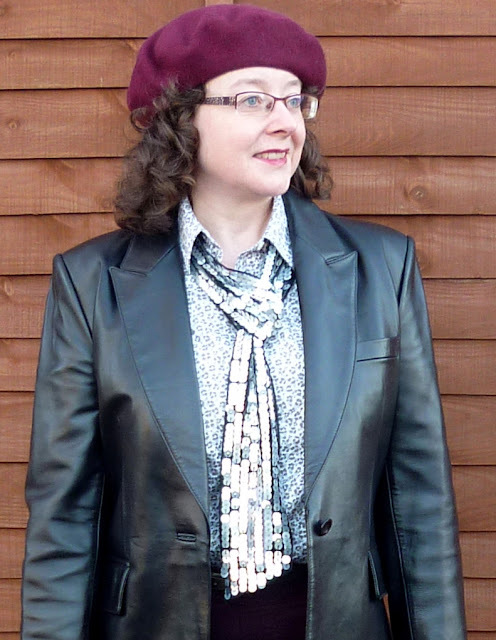 I like this look on Jacqueline so much and you know I never met a sequin I didn’t like so I am especially wild for her sequin tie! I blew up the shot so you could see it in better detail. Check it out! I had to show this tie. Divine! 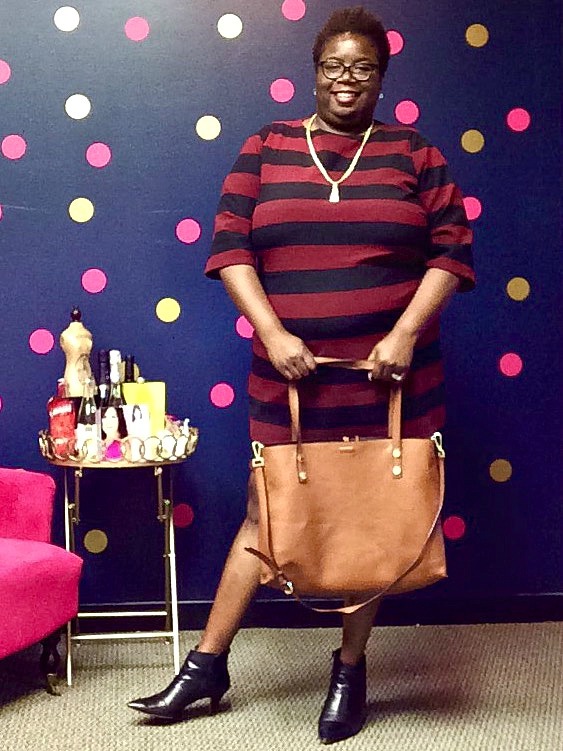 Trina looks like such a stylish jet-set traveler! I love her hat, the tote and the scarf she ties to it. Babe Paley, the beautiful New York socialite who is said to have started the trend of tying a scarf to a bag (in the 1940s, I think), would approve too! I do love a Le Pliage tote, they are everywhere on ladies in NYC, in all colors, and one of these days I am going to have to pick a color and buy one myself! 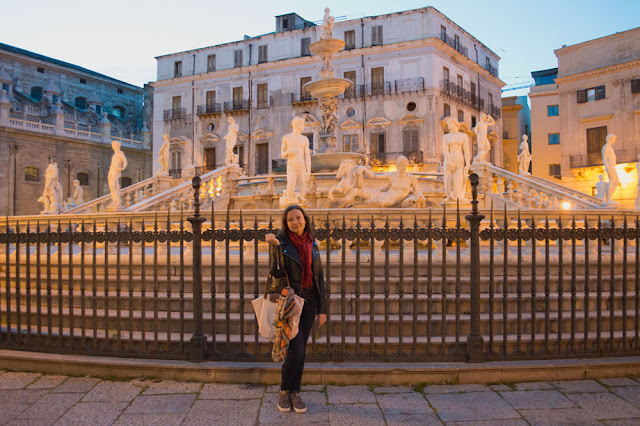 I like this pale beige version on Maryna, it’s a shade I was considering too, and doesn’t this color seem absolutely perfect on Maryna and in front of this amazing fountain? She is so lucky to be living in Italy right now! 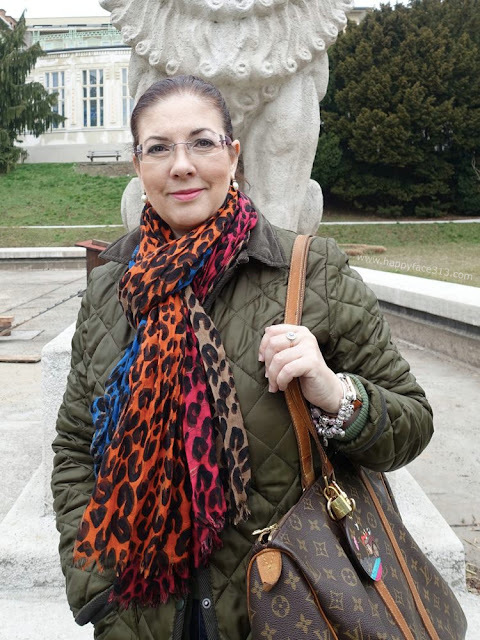 I love this look on Claudia so much, the multicolored leopard-print scarf (also Louis Vuitton maybe?) is wonderful, especially when paired with the Louis Vuitton tote. Below is her vintage Malesherbes, which is such a ladylike and gorgeous design. Behold again the power of a scarf tied to the bag! Is that a Longchamp Le Pliage I spy next to it? What a great bag combination! 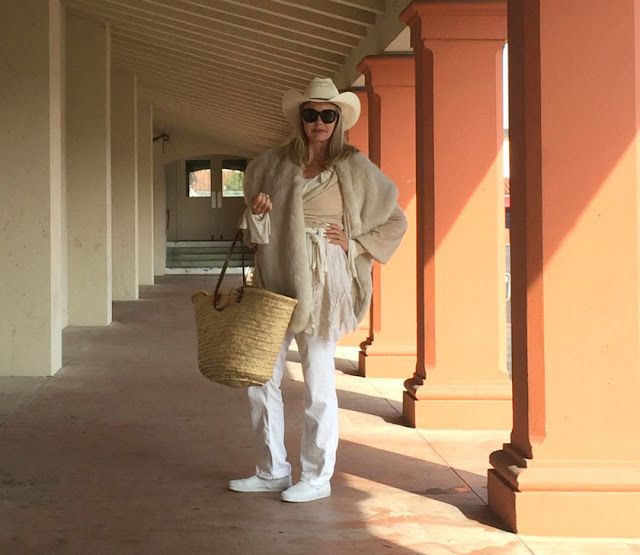 April looks so stylish here in neutral colors, carrying her lovely tote with contrast lining and wearing amazing silver jewelry! I love that big necklace and cuff on her. This is a great transitional look as we get closer to spring, don’t you think? You know I am a big fan of Nora’s style, which is so clean, modern, elegant and feminine, so I love that we get two pictures of her this month! 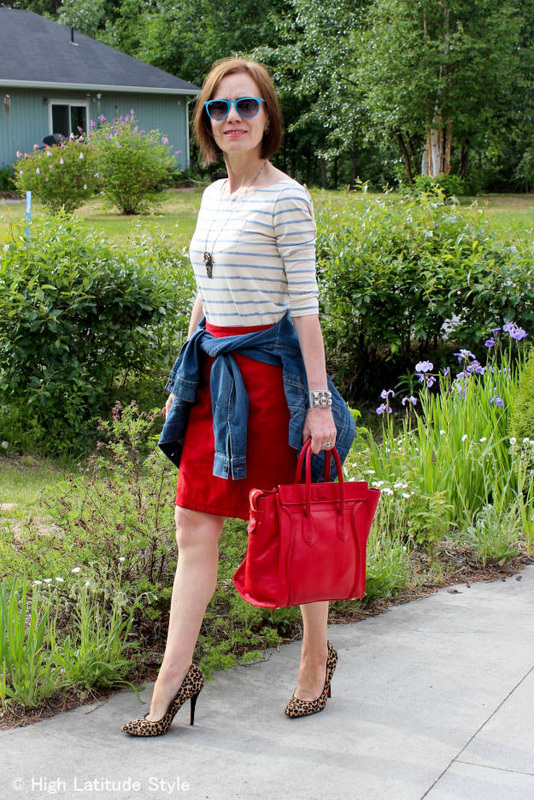 I love this blouse in both colors and the gorgeous red Prada tote just ups the glamour quotient all the way around. This is such a great red tote on Nicole and once again I admire how she uses red (and leopard, look at those pumps!) as a neutral. I love this stylish tote on Malia, it seems like it would make a chic travel bag as well. And I like that her striped dress looks so great against a polka dot background! I love that our resident mix master has managed to work in three different prints in this ensemble. Her striped tote seems like it would be perfect year-round, for the park, the beach, and beyond! 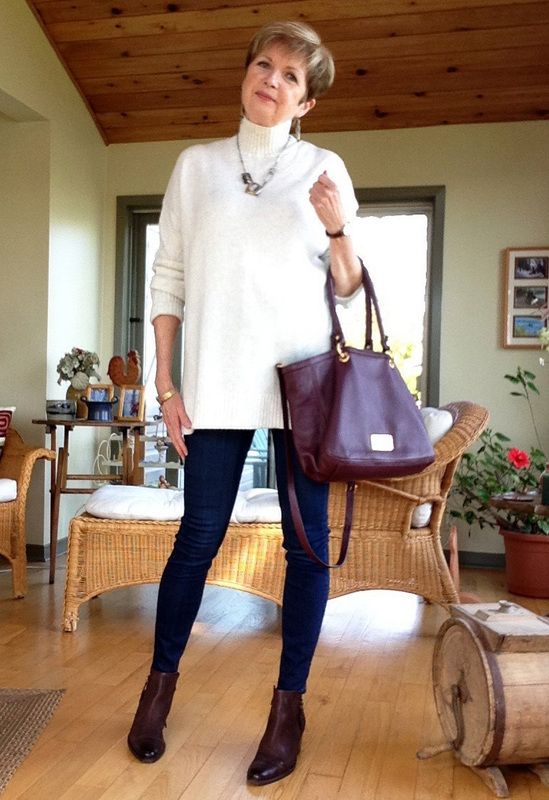 I love this look on Susan of skinny jeans with an off-white sweater, statement jewelry, and brown ankle boots. I am crazy for the color of her Marc Jacobs tote, I have seen this beauty in person and that bag would be a chic workhorse in any woman’s wardrobe! I love this iced-out pink tote on Linda so much, especially worn with pink, white and black. I think she will get a lot of use out of this tote and a ton of compliments on it as well! There is nothing more classic than a black leather tote and how lucky Pam is to have been given this by Saks Fifth Avenue! It looks great here paired with a white tunic and dark denim. I do love an ostrich pattern so I am a big fan of Rena’s tote. This one is a perfect size! I like that she paired it with a floral print skirt and terrific navy wedge pumps. And did I read that right, she has a tote for tap dancing? I love knowing Rena is a hoofer! 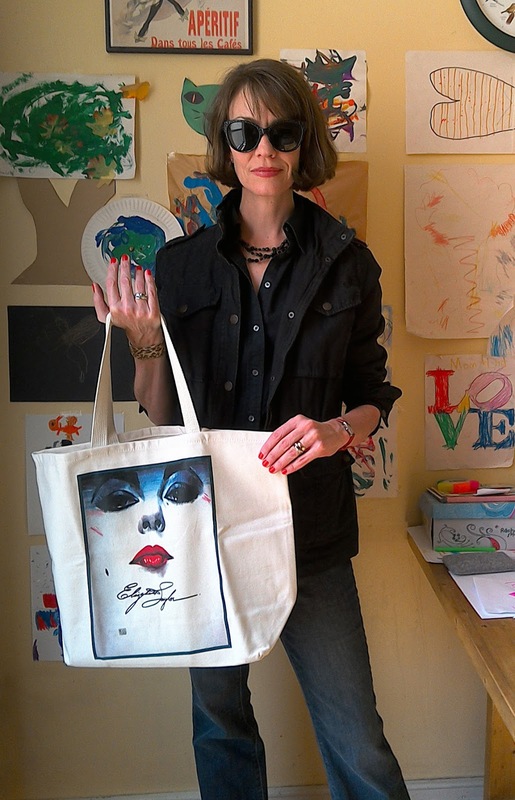 Suzanne has nothing to regret, it’s a cool tote and now I want one too! 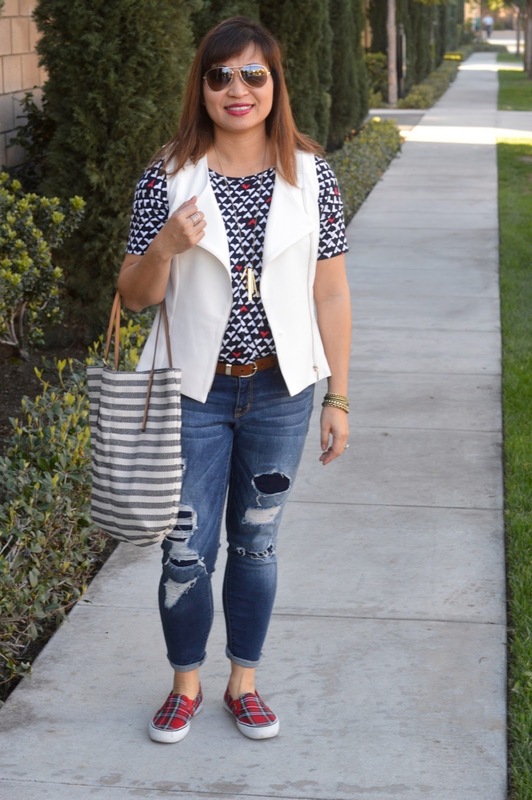 I feel an eBay hunt coming on…I love this entire ensemble, from the blouse to the denim, from the bunny tote to the two-tone shoes, which remind me of spectator pumps. Oh how I love Tamera for wearing this to San Diego, one of the U.S. capitals of shorts and flip-flops (I lived there for many years so I ought to know!). I’m sure San Diegans were doing double and triple takes to have such a vision of glamour in their midst. I love this look on Tamera! I love a tote in an unexpected color so this orange Adora bag is unusual and eye-catching! I really like how Cheryl has styled it here, it pairs so well with the colors in both her jacket and jeans. Cherie is making me laugh because I so know what she means! 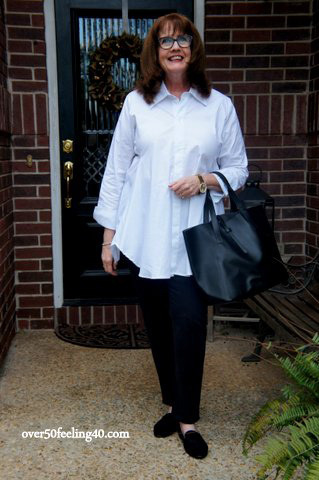 I wish more moms were dressed like this at school pick-up, I love this look on her, especially that unusual tote! I use a tote more than any other bag, especially for carrying around groceries and library books. When I spied this Elizabeth Taylor tote on eBay a couple of weeks ago I put a bid in immediately! I was the only one who wanted it so I got it for less than twenty dollars. The seller said it was a tote created for Liz’s 60th birthday party by illustrator and designer Michaele Vollbracht, a fact which I haven’t been able to verify, so if you have any information let me know in the comments section. I love the color and drama of Liz’s face here! Love this vision of Liz by Michaele Vollbracht. The seller wrote in her description, “Take those kissable lips with you everywhere,” which made me laugh since that’s what I intend to do. This will be my new library tote for hauling home all those gigantic jewelry books I check out (I have five at last count). I wanted to keep the focus on Liz (I’m sure she would’ve approved) so I paired the tote with dark denim, a black shirt, a black field jacket from Levi’s, and a faux jet necklace with scattered floating beads. The nail polish is one of my favorites: “Caught Red-Handed” by L’Oreal. Those orangey-red shades always feel so old Hollywood to me, the kind Liz herself might have worn back in the day! A faux jet necklace and “Caught Red-Handed” polish by L’Oreal. 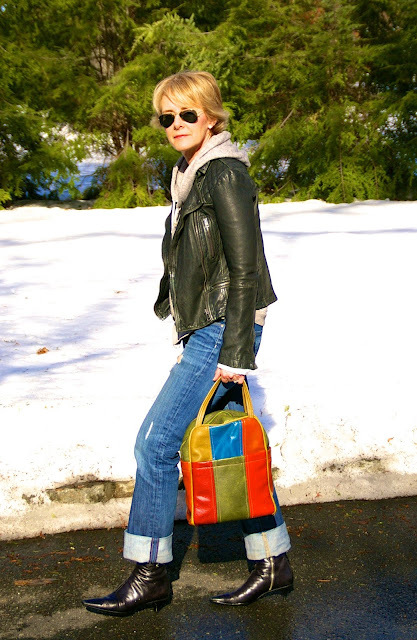 I hope you are out and about with your tote, enjoying the end of winter! 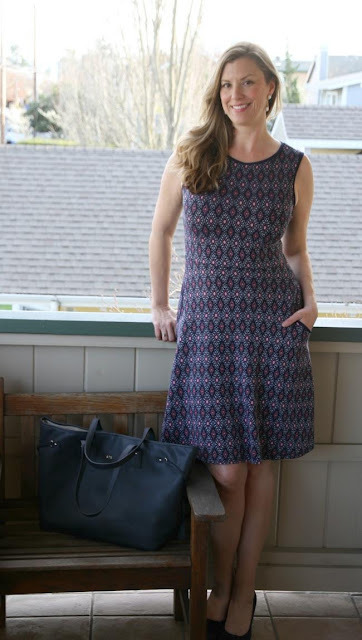 For April’s “How I Wear My” we are going to focus on a look that never goes out of style—boho! So break out your flare jeans (or maxi dress), your long cardigans, your floppy hat, and all that fringe, and join us! Photos are due April 4, 2016 and you can send them to us at howiwearmy@yahoo.com. Be sure to tell us a little about your bohemian look! Be sure to swing by Adrienne’s to see even more looks alongside a tote. :-) I couldn't wait to get home tonight to look at all the wonderful ladies and how they wear their totes. so much fun! True eye candy. With regard to your question: The black bag in the background is a Longchamp Le Pliage "shopper" with long handles. Thank you very much, for putting this HIW together again. Jill that is a fantastic tote! Also you Suzanne! And all I can say about Adrienne is that dress is stunning and a great fit!!! Claudia has quite the selection of super high end bags! I adore Cherie's vintage tote and your one-of-a-kind Ebay purchase Jill. How unique and fun! I always look for to this series every month and this month is no exception. Love your new tote! 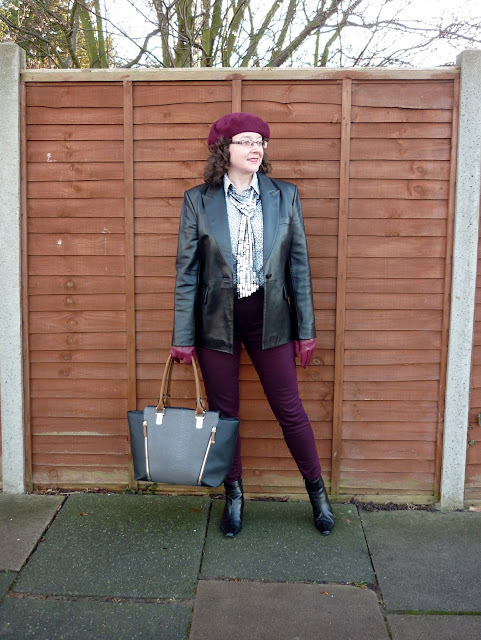 You look so urban chic & cool, Jill! 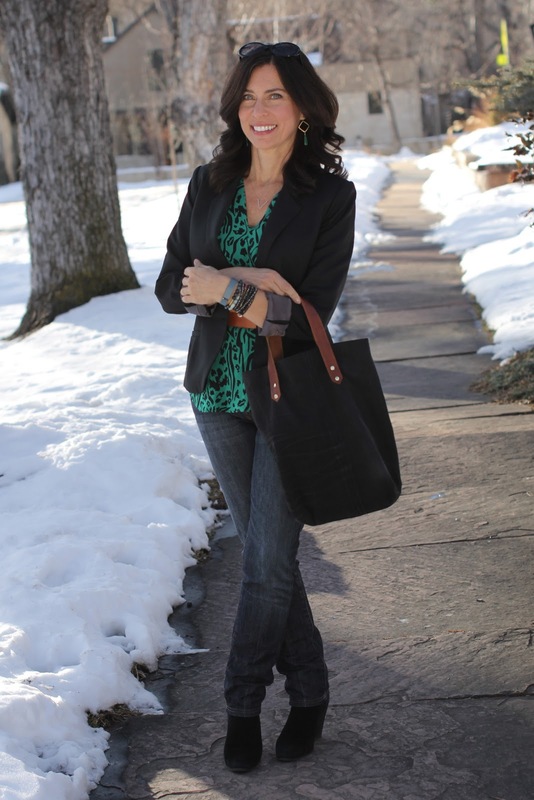 Love this look on you and what a fun tote! Yay for boho next month! That's a lot of bag Jill...are you carrying a sand wedge? A custom Liz Taylor bag for 20 bones?!?! Sounds very Fortensky. Such a great post, Jill! I love your Liz bag. It's fun, glamorous and colorful and Liz is the ideal style icon for you - you have all that jewel-loving in common! Looking forward to Boho next month - a lot! So many different totes of all different styles and colours. I do have a soft spot for Dawn's furry tote, Suzanne's unusual tote and I love the scarf tied to Claudia's bag. Thanks for hosting Jill and Adrienne.